If you love that perfect blend of hazelnut and chocolate that makes up Nutella then there’s a day just for you! Tomorrow (Feb. 5) is National Nutella Day and the pastry chefs at Amorette’s Patisserie in Disney Springs have come up with the perfect, irresistible treats to honor the occasion. These Nutella-themed treats are only available tomorrow, until supplies last, so let’s take a look at them! Hey Guys! Remember when we told you all about the 20 Disney Snacks that you HAVE to try? Well, today we’re back with 20 more in our latest DFB Video! Ah. Disney Snacks. There are some crazy amazing ones to choose from! 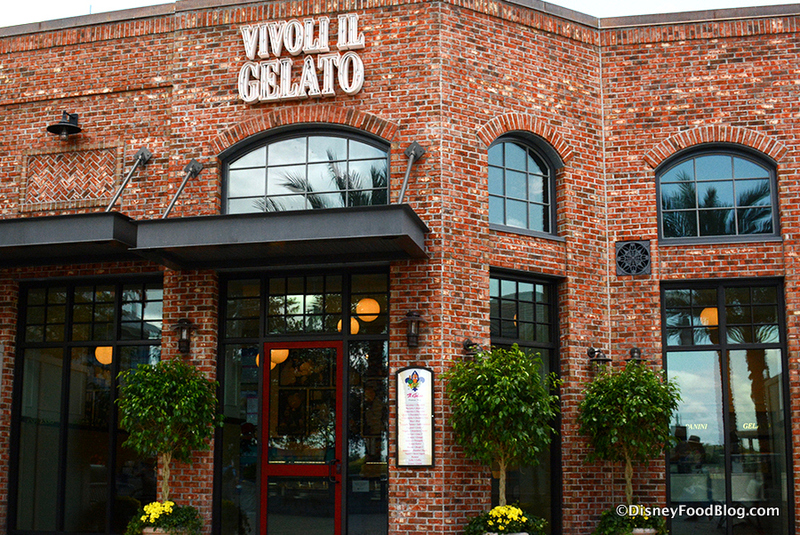 From sweet to savory, with a couple that are both, we can’t get enough. Bonjour! 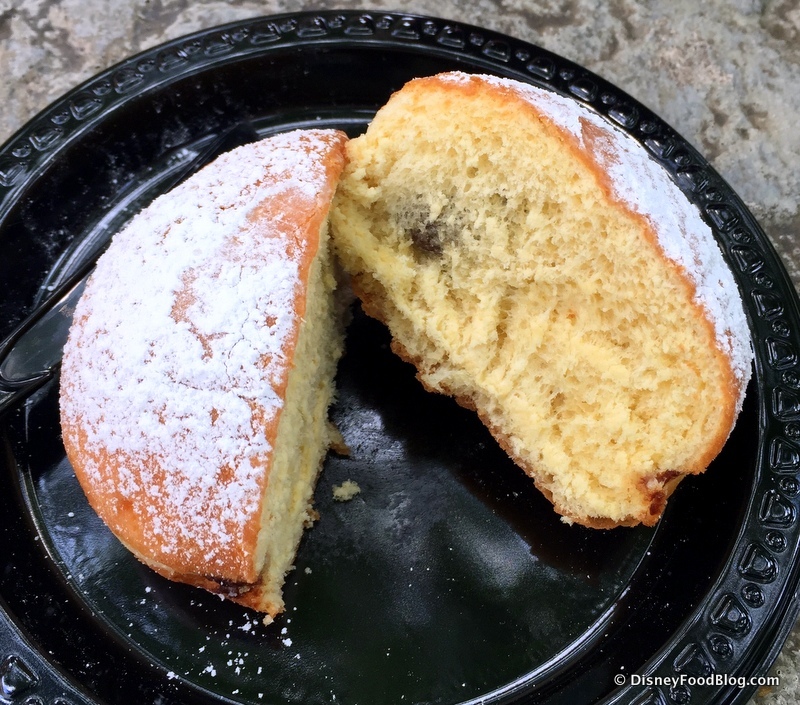 We are popping into Les Halles Boulangerie and Patisserie in Epcot’s France Pavilion today to take a closer look at a new-to-us pastry! But on a recent visit to Les Halles we were intrigued to read that the Beignets seemed to be different, since they were described as Chocolate Hazelnut-filled. Yeah…that’s all it took to get us there. The previous beignets at Les Halles were Bugnes Lyonnaise, diamond-shaped with a hole in the middle, and were rolled in granulated sugar. So when I was handed this treat, it was clear that we were dealing with something completely different. 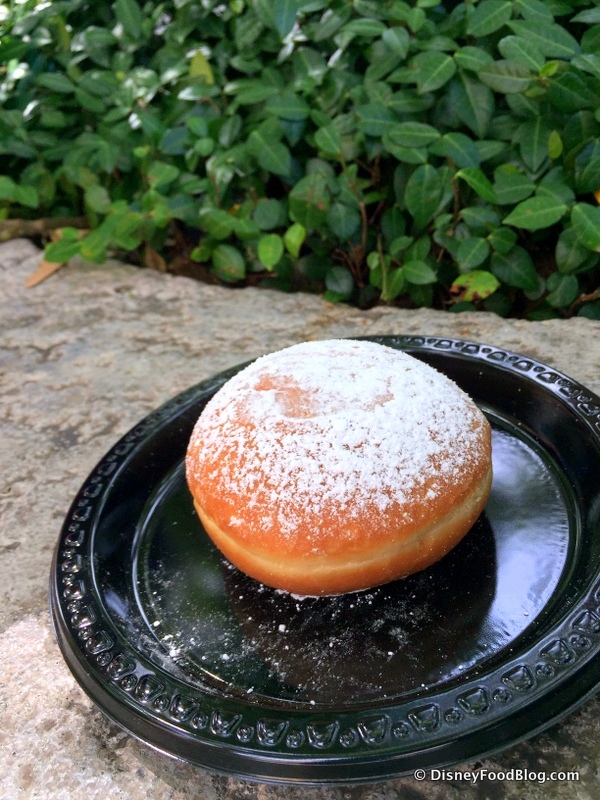 We took the snack to my favorite secret hide-y place in the France Pavilion. (Nope, not tellin’ ya where…OK, behind the perfume shops. But don’t tell.) It’s a wonderfully quiet and shady spot — a perfect place to dig into Les Halles loot! As you can see, it looks like a traditional filled doughnut. 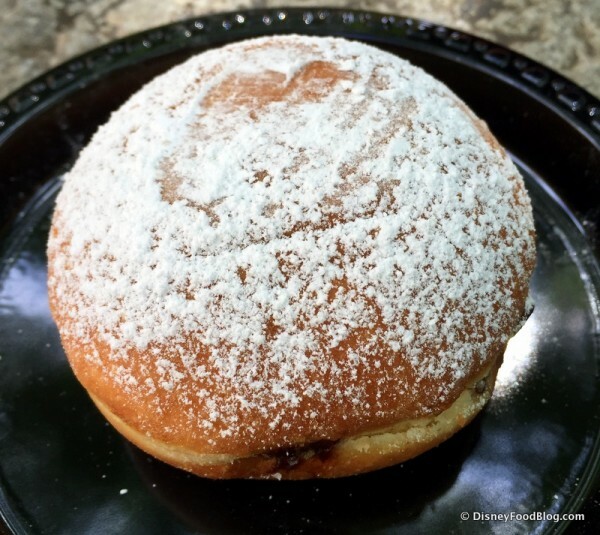 Actually, it reminded me a lot of the Berliner featured at the Germany Booth during last year’s Epcot Food and Wine Festival. Time to cut into it! I went for it, expecting to see a snug little pocket of chocolate Hazelnut filling. But this is what greeted me on the cross section. 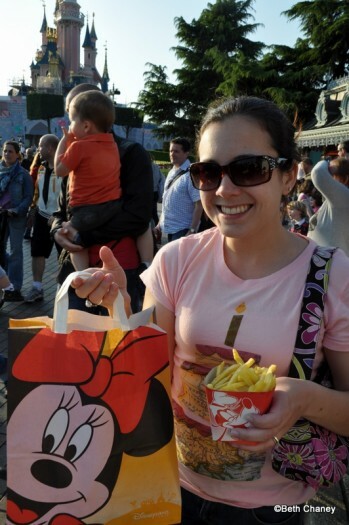 I’m excited to present a guest review all about fellow blogger Beth Chaney’s exploration of street food and snacks during her recent visit to the Disneyland Paris resort. Hi DFB readers! 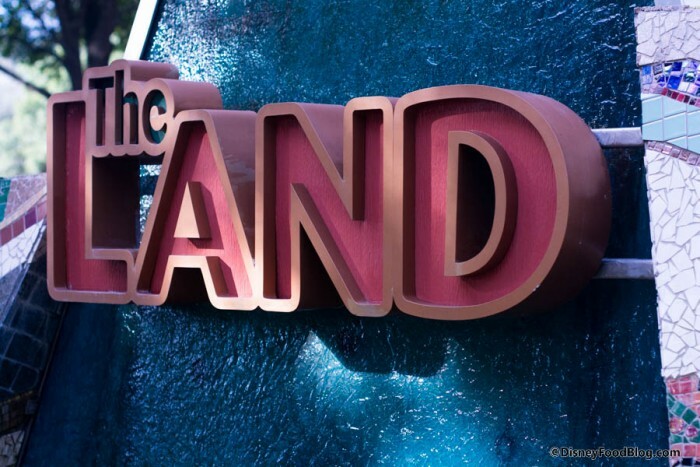 I’m excited to share a bit of my experience at the Disneyland Paris (DLP) resort. 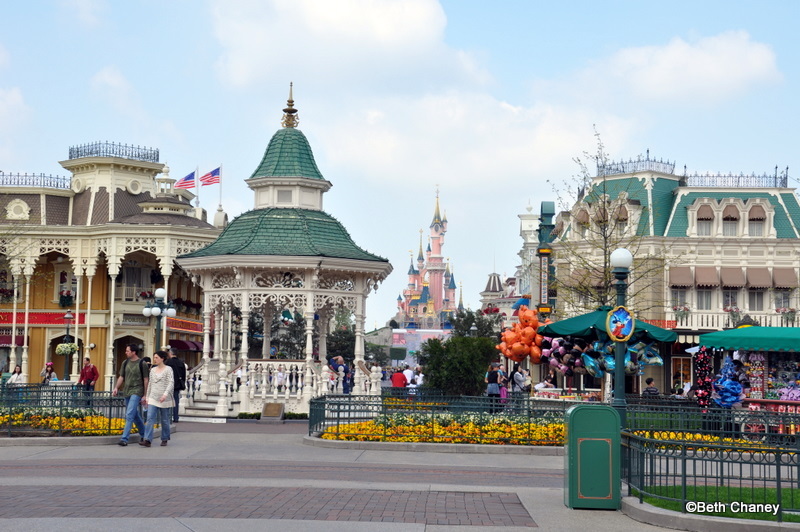 As a long time Disney fan and Disney park goer, I had to add a day at Disneyland Paris to the itinerary of my recent trip to France. And one of the things I was most excited to see at DLP was how Imagineers had transformed the American park experience for a European audience — especially the food! 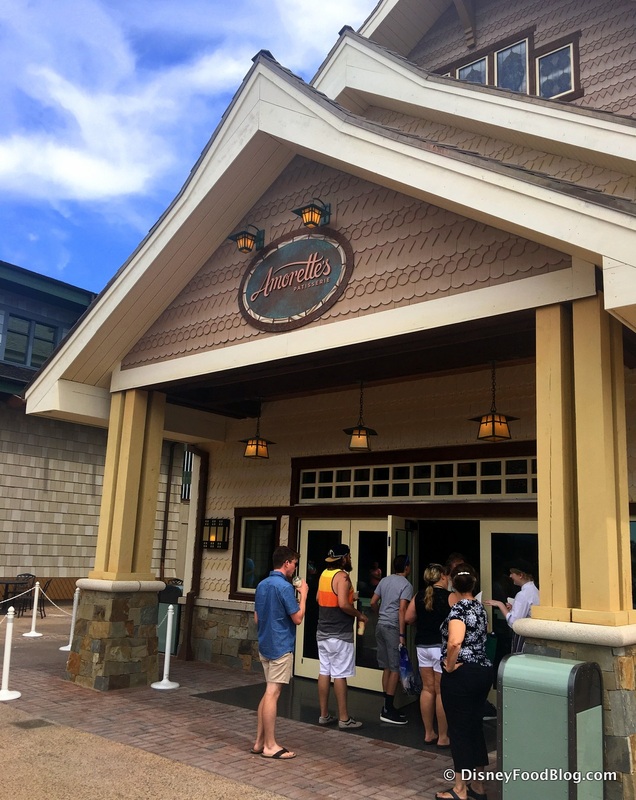 Food is such a part of the Disney park experience — from popcorn to Mickey Bars to rice krispie treats; but how would that be captured for an international audience? Especially for an audience that is supposed to be a bunch of foodies? And what better place to explore than along the streets of the Disneyland Park! Street Food is big at Walt Disney World, and the same thing was true at DLP. Although not as numerous as at the Florida parks, there were lots of little carts on the street selling snacks and sweets. The most popular item? 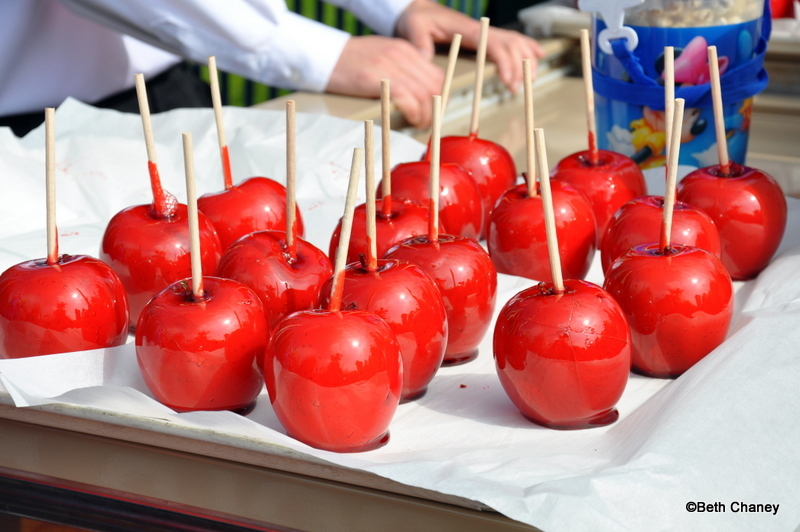 Candy apples, which seemed to be at just about every cart! 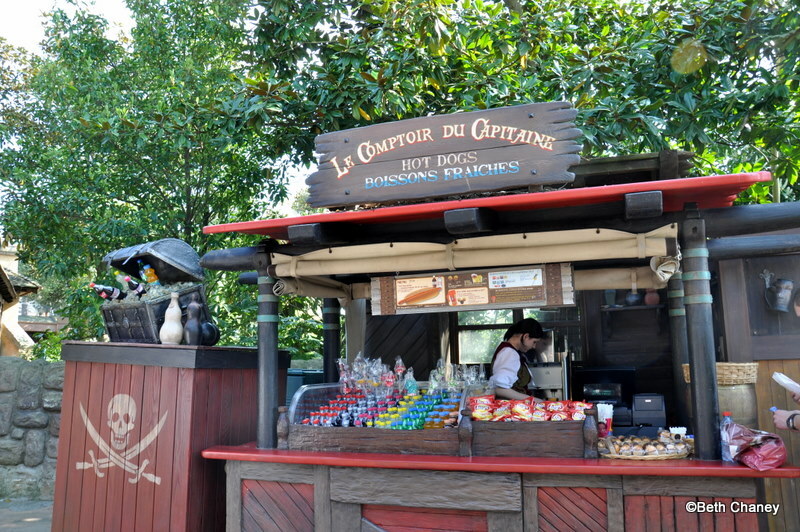 After candy apples, the next most popular item at the street carts were “hot dogs.” But these aren’t American hot dogs (although those are available at Casey’s on Main Street — which just happens to be in the exact same spot as the outpost at WDW!). These are more foot long sausages baked into french bread and sometimes topped with cheese. So more of a sandwich than an American hot dog. You heard me right! Waffle sandwiches!!! 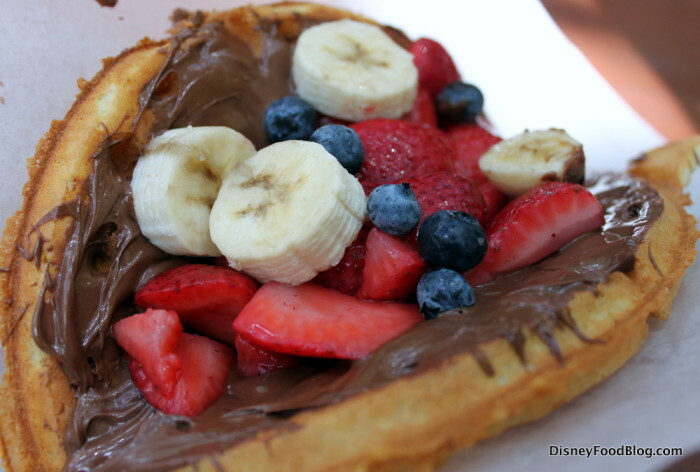 Sleepy Hollow, the small counter-service location in Walt Disney World’s Magic Kingdom Liberty Square, has long offered some of our favorite snacks, including the large Mickey-shaped waffles (one of the last places you could get these! ), and the filling and delicious chicken and wild rice soup. We’ve heard through the grapevine (Thanks, Laurie!) that the menu has changed significantly and asked one of our colleagues, Brooke Fehr from DisZine.com, to investigate during her recent WDW visit! The new menu at Sleepy Hollow has introduced what we think will be a new Disney food classic — waffle sandwiches. And these are true waffle sandwiches — as in a giant waffle with stuff crammed into it, then folded over! There are three new offerings: A sweet and spicy chicken waffle and a ham, prosciutto, and Swiss cheese waffle, both for $6.99; and a Nutella and fresh fruit waffle for $5.59. None of these are currently listed for a snack credit.